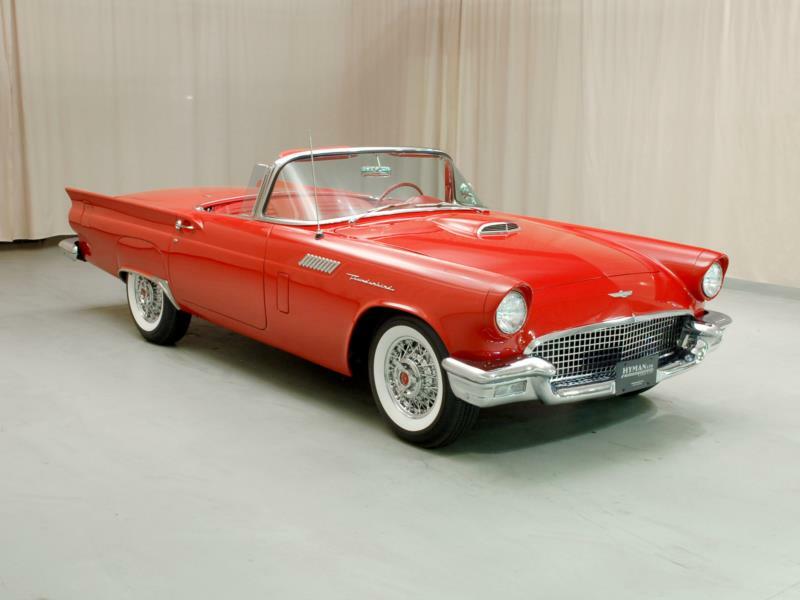 Ford’s original two-seat Thunderbird, inspired by Chevrolet’s Corvette, went into production on September 9, 1954. 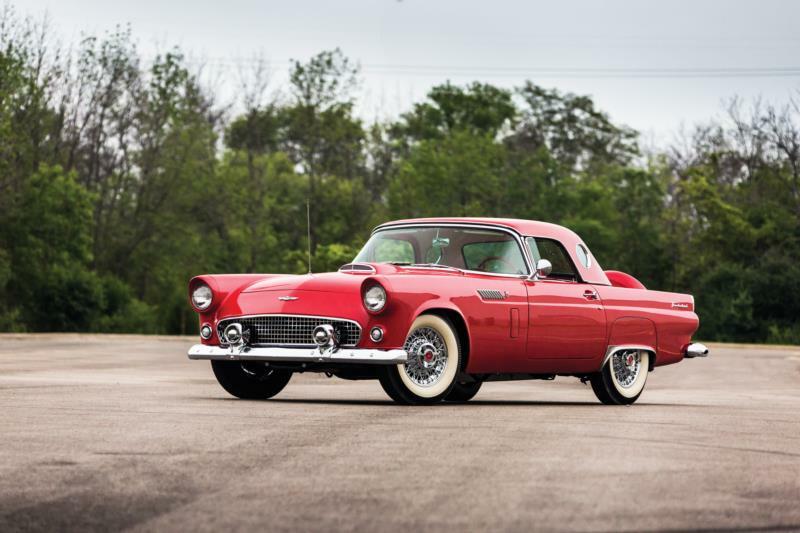 Like Chevy’s fiberglass sports car, the steel-bodied 1955 T-bird rolled on a 102-inch wheelbase, but the similarities ended there. 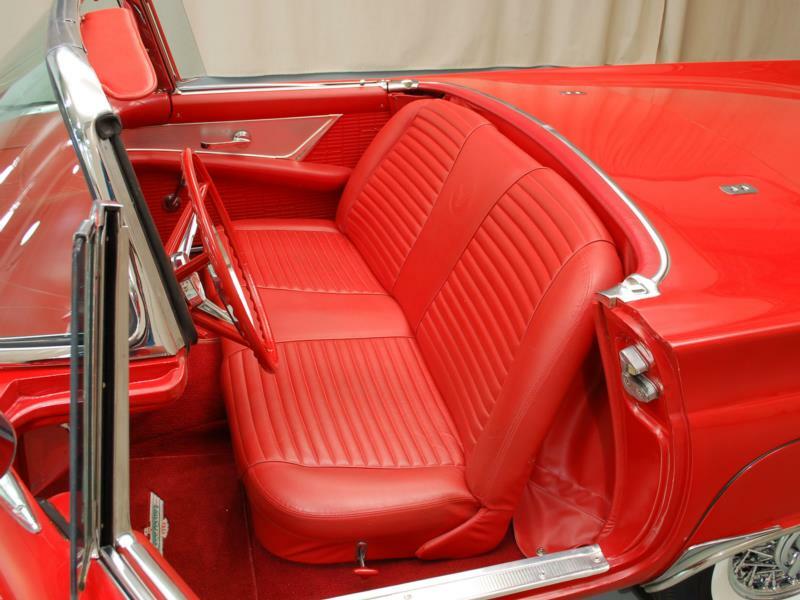 Save for some early applications, a removable fiberglass hardtop was standard, as were roll-up windows and V-8 power, all features unavailable to Corvette customers early on. 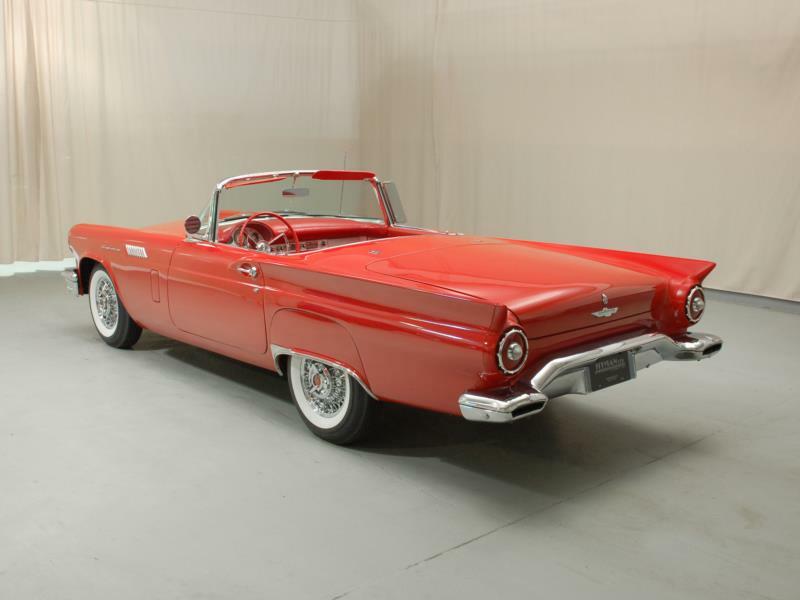 The Thunderbird V-8 was a 292 cubic-inch Y-block topped by a single four-barrel carburetor. 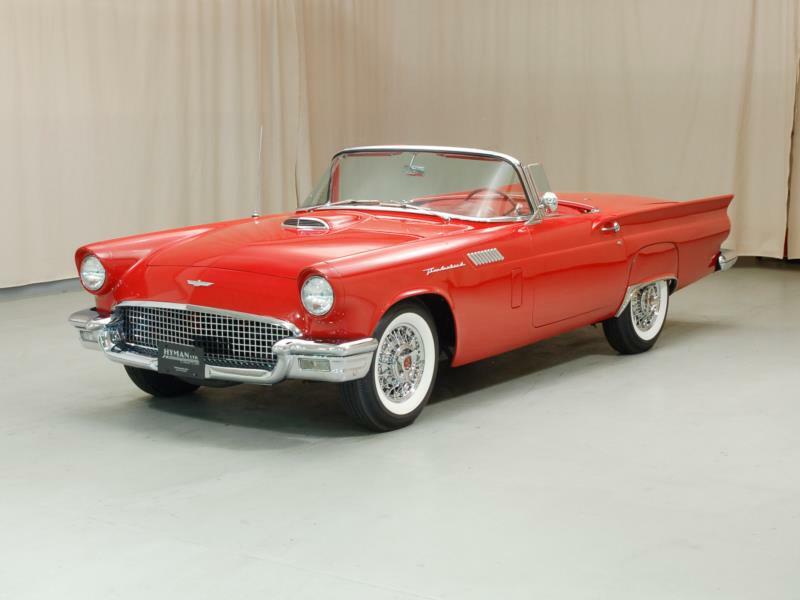 Output was 193 horsepower with the standard 3-speed manual, and 198 horses when the Ford-O-Matic automatic was installed. 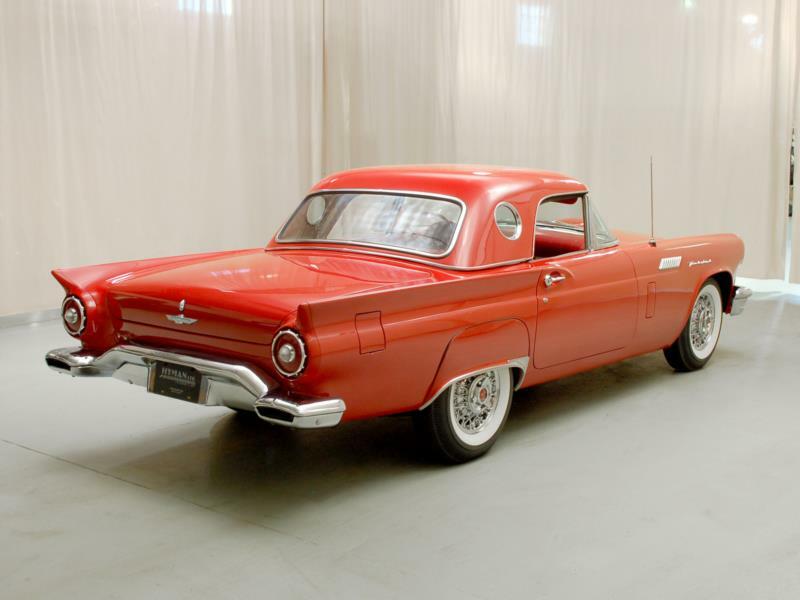 More power increases followed in 1956 as the standard 292 V-8 was up-rated to 202 horsepower and an optional 312 cid Y-block appeared with either 215 or 225 horses. 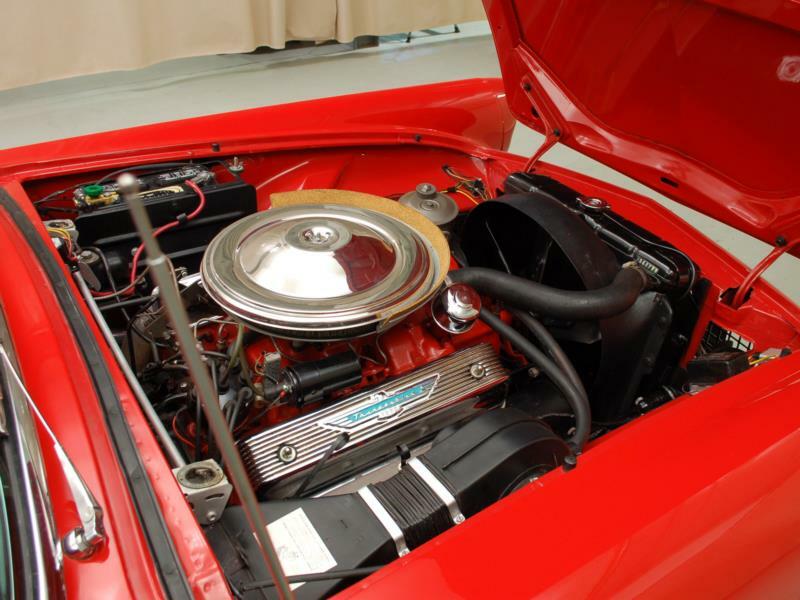 Optional dual carburetors were introduced later that year to help the 312 reach 260 horsepower. 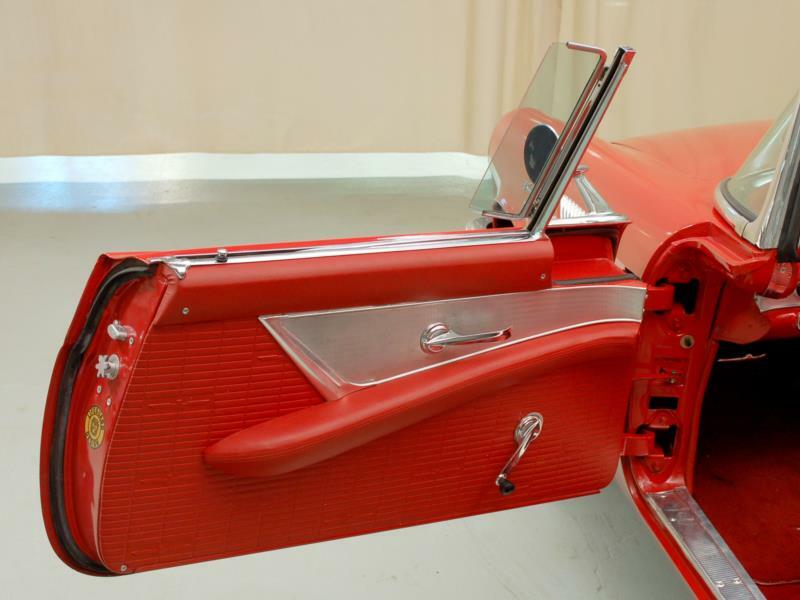 Additional updates for 1956 included available “portholes” for the removable hardtop and a Continental-style spare tire carrier out back. 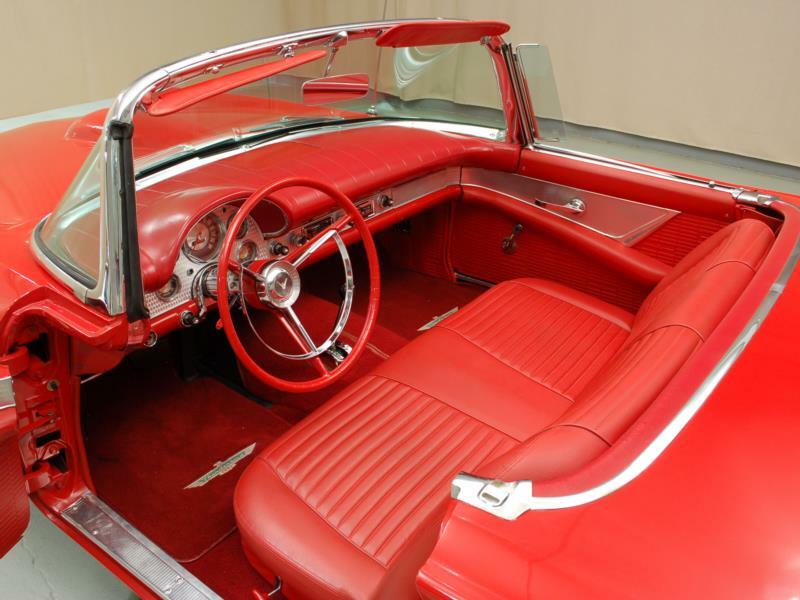 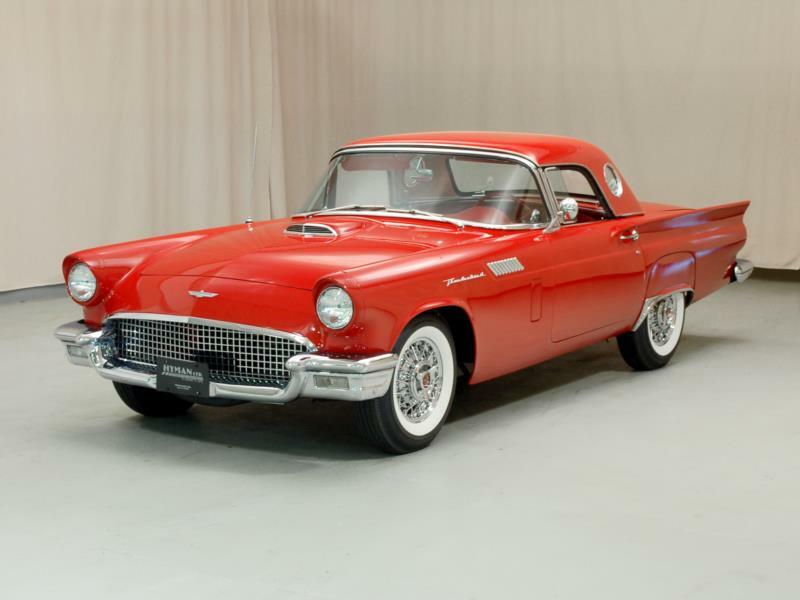 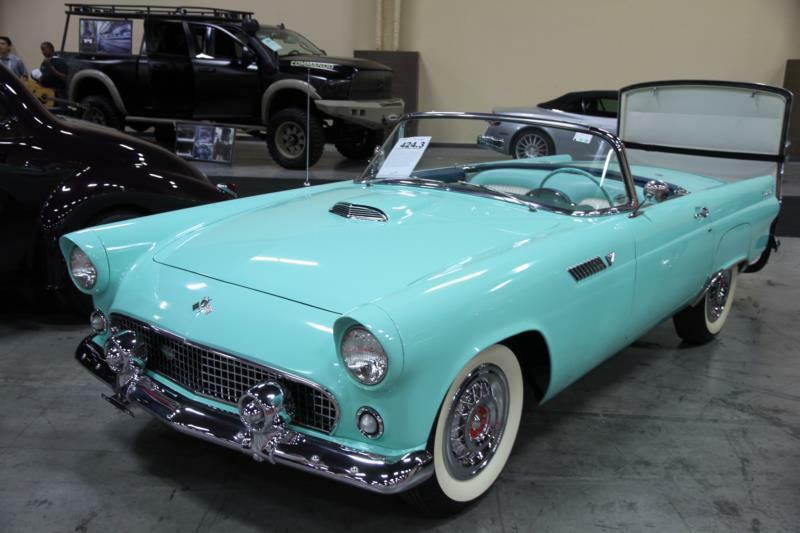 Ford officials initially had their sights set on building 10,000 Thunderbirds for 1955. 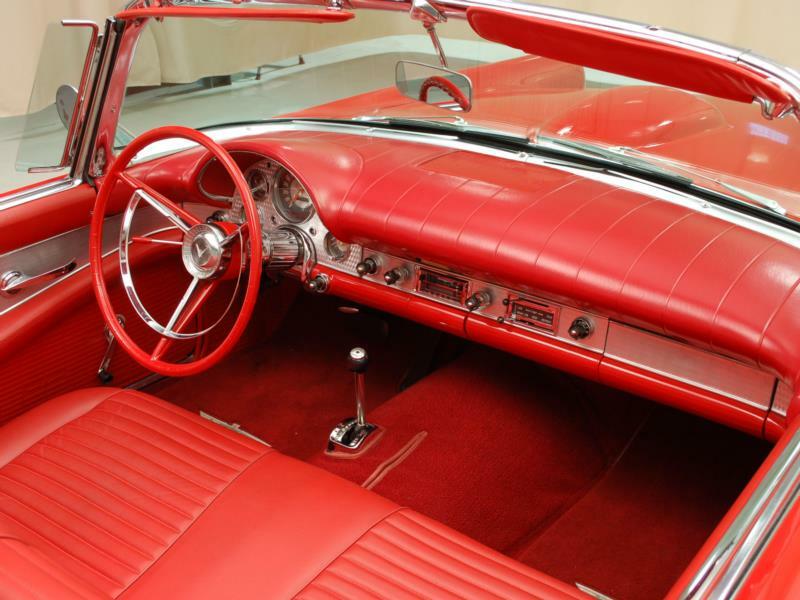 The final tally read 16,155. 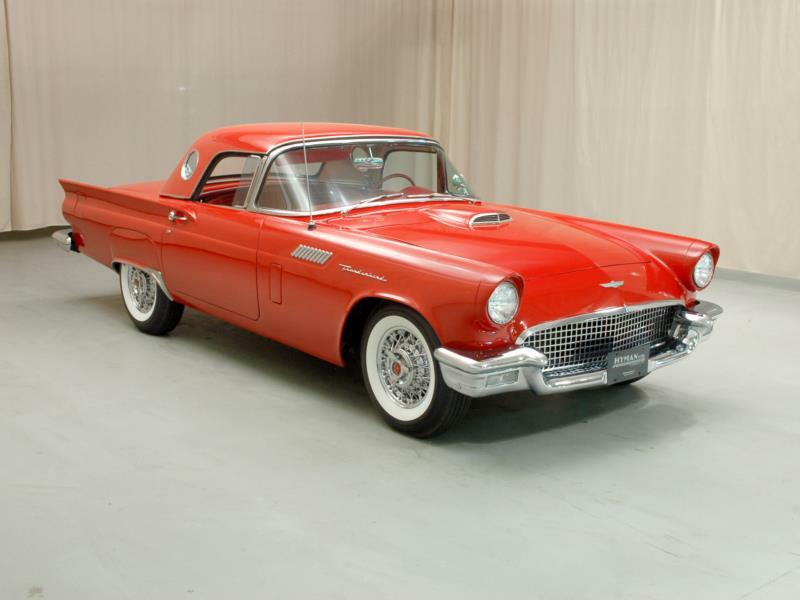 After a slight dip to 15,631 in ‘56, production of the last — and in many minds the best — two-seat T-bird reached 21,380 in 1957. 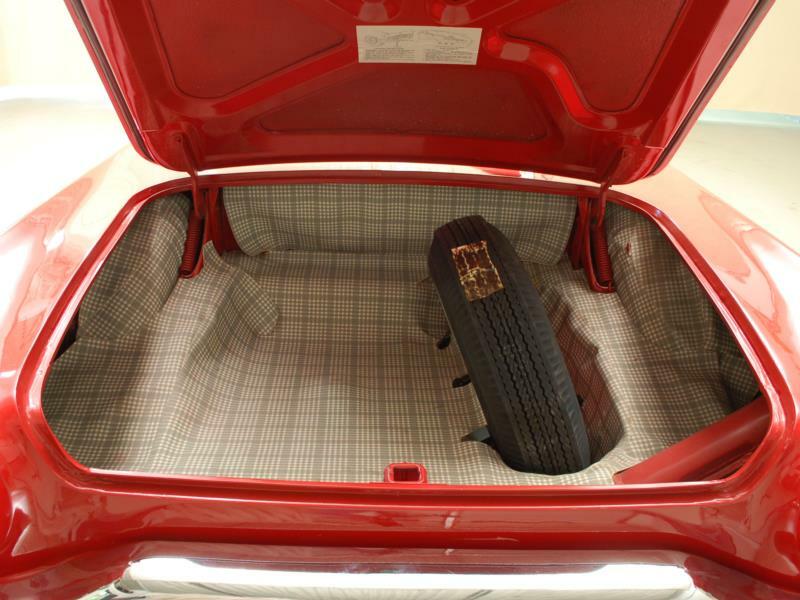 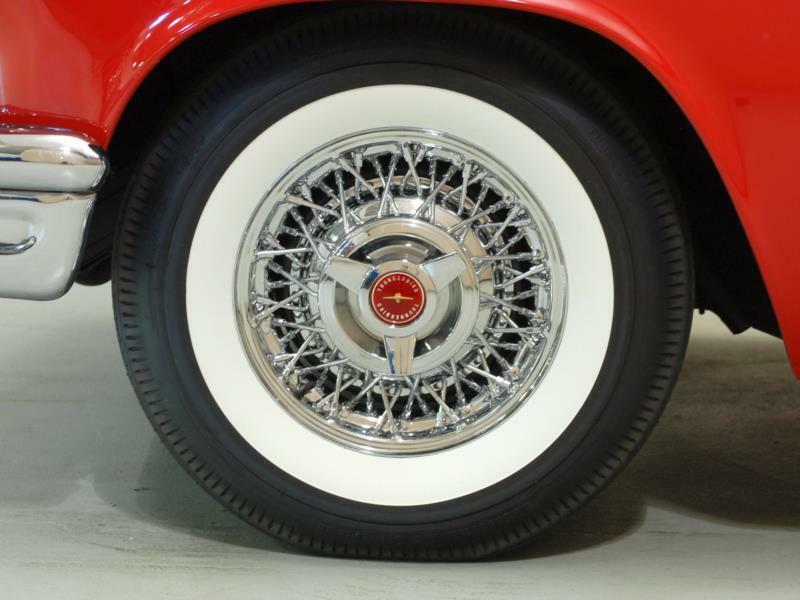 The Thunderbird’s spare tire went back inside the trunk in 1957 and the rear body was lengthened about 6 inches. 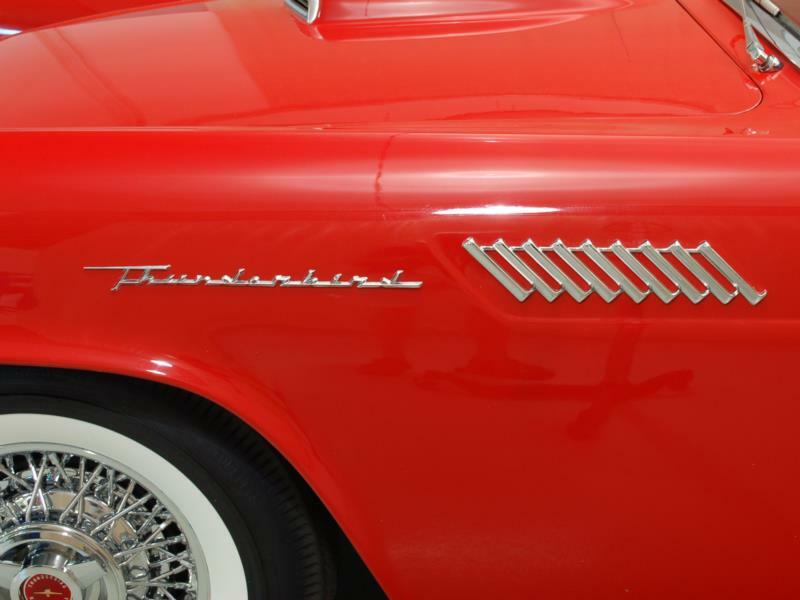 Complementing the extra length in back were outward-canted fins atop each rear quarter, courtesy of legendary designer Frank Hershey. 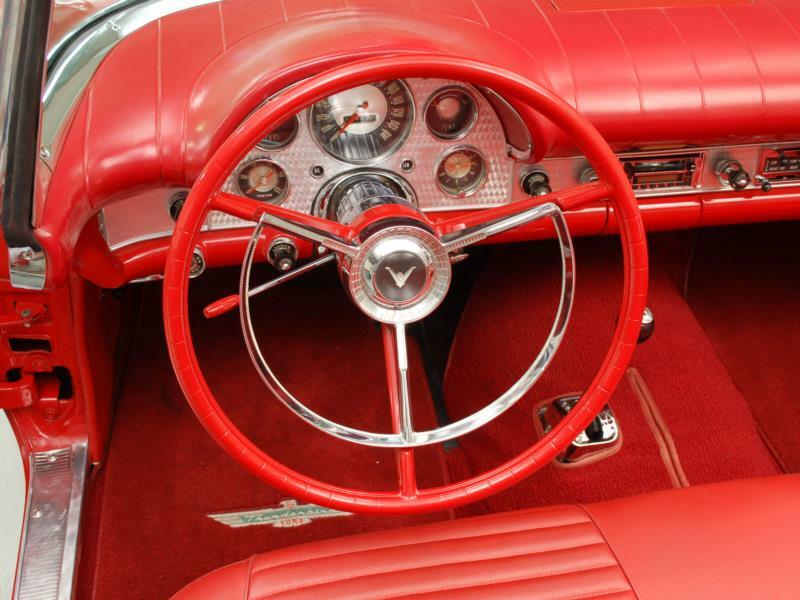 Both the 292 and 312 Y-block V-8s returned for 1957, as did the dual carburetor option, or “E-code” engine. 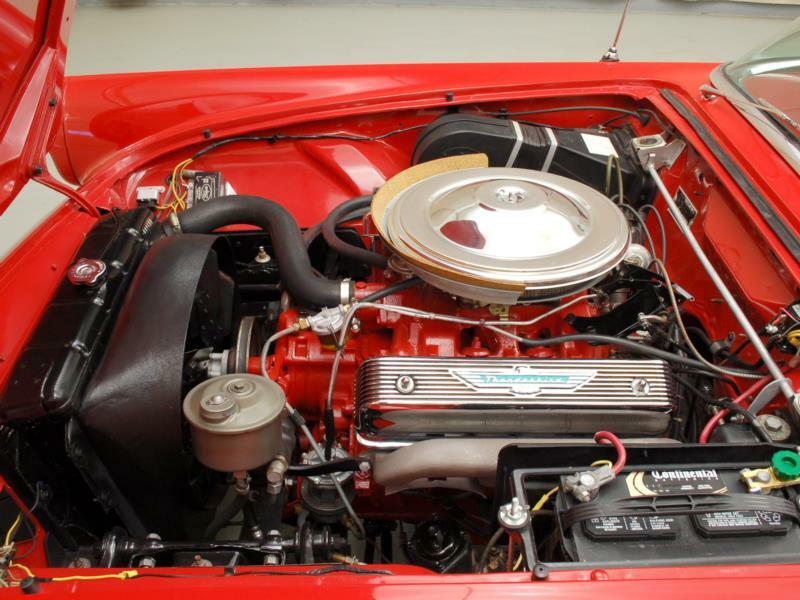 The “base” E-code 312 was rated at 270 horsepower; adding the “NASCAR kit” cam boosted output to 280 horses. 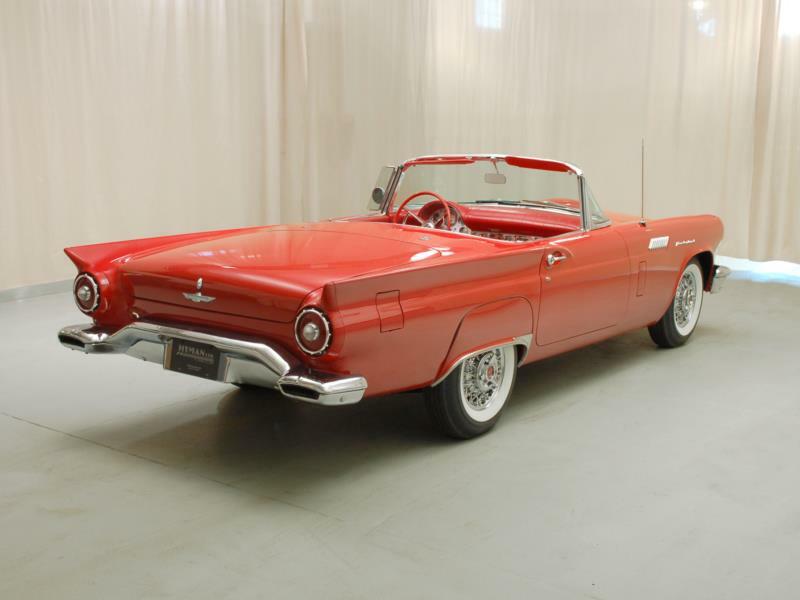 Also offered briefly in 1957 was the F-code 312, a supercharged V-8 advertised at 300 horsepower. 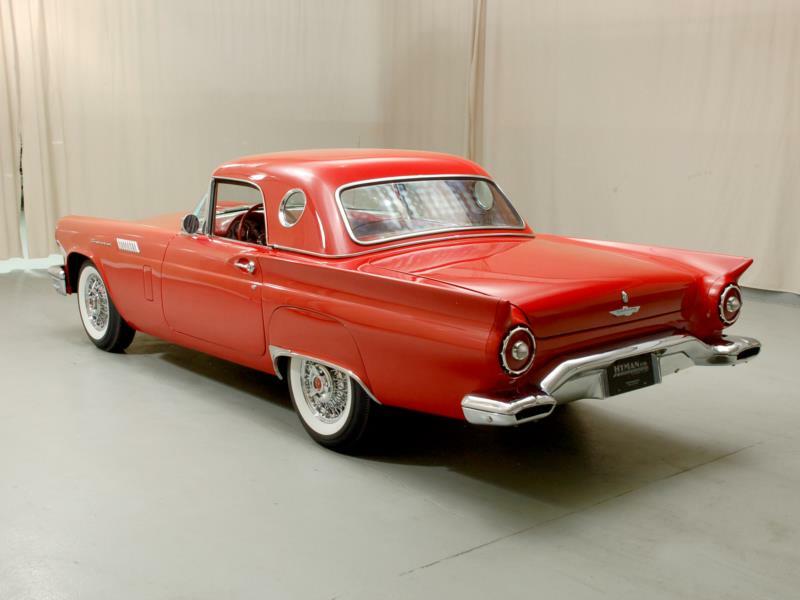 With the NASCAR cam, this blown Y-block produced 340 horsepower. 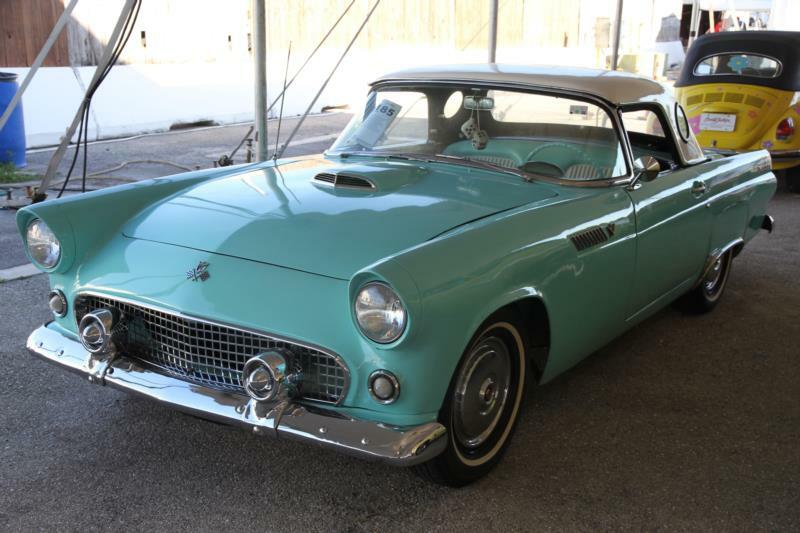 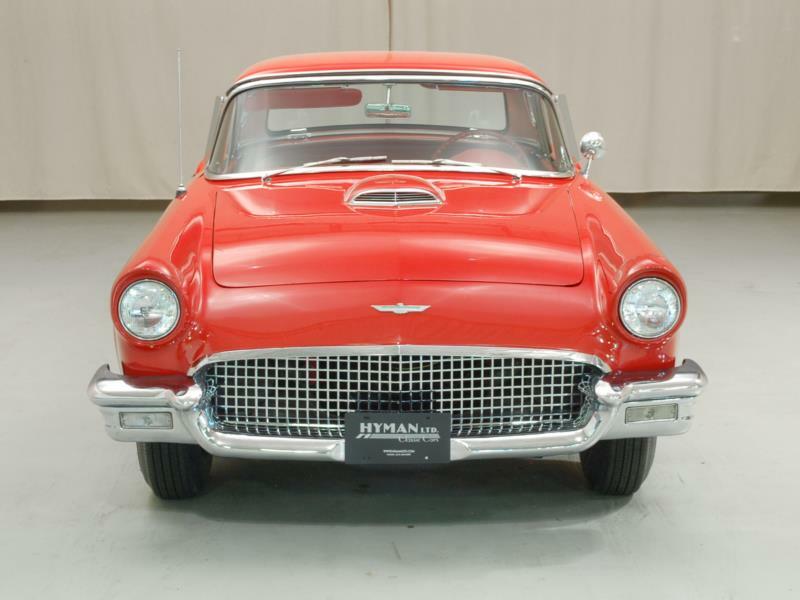 Click here to read Hemmings Motor News' Buyers Guide for the 1955-1957 Ford Thunderbird.